ABC Russian: Каждый or всякий or любой? What is the difference? Каждый or всякий or любой? What is the difference? What is the difference between these 3 almost similar words? As you see, there are 3 translations with «any» for all three words. 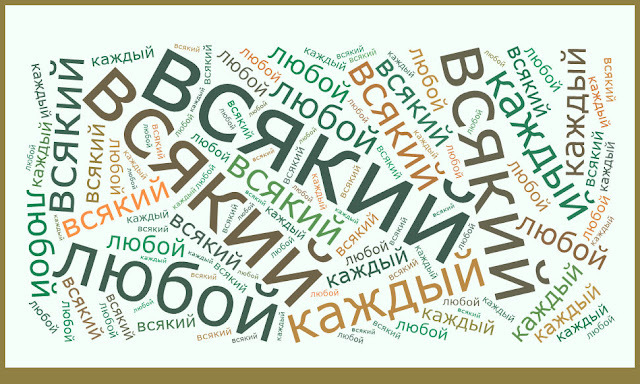 Almost all students have difficulties in usage of these three weird Russian words. Let’s sort it out! This adjectival pronoun can be easily translated as each or every. Pay attention that all these adjectival pronouns has 3 genders and plural form as any other adjective and decline in the same way as an adjective. Каждую пятницу я хожу в бар. Every Friday I go to the bar. Антон знает каждого преподавателя в университете. Anton knows every lecturer in the university. Каждые два дня она ходит в спортзал. Every two days she goes to the gym. This Russian adjectival pronoun can be translated as each and every as well but in the meaning: all sorts of, generally it’s not important who or what kind of. Бабушка рассказывала нам всякие интересные истории. Our grandma used to tell us all sorts of interesting stories. У него дома были всякие интересные старинные вещи. There were all sorts of old interesting things in his house. Note! There is the idiomatic expression in Russian language! На всякий случай! - Just in case! Because of the possibility of something happening. Возьми зонт на всякий случай! Take the umbrella just in case! Лучше возьми ключи на всякий случай, если я уйду. You’d better take the keys in case I'm out. Возьмите любую книгу. Take any book! And now you can try to do exercises. Write you answers in the comment box. ………….воскресенье наша семья ходит в церковь. Я занимаюсь спортом в ……………погоду. Какие цветы вы любите? Я люблю……… цветы. ……. ребёнок в России должен ходить в школу. ……………….человек может позвонить нам в офис. Он может познакомиться на улице с…………девушкой. На столе было много………….вкусной еды.